A dining room is not just a place for the family to congregate to eat, but also to entertain, and throw formal dinner parties. Dining Room furniture has thus acquired a multifunctional character, and come in numerous styles, ranges and quality levels to accommodate and reflect an individual’s taste, needs, and style. The functional of dining room is one of the most important rooms in our home where we can gather with family and friends to share great food and memorable moments. However, we need to create our dining room with nice design, interesting dining room furniture or dining room sets according to the home situation. The range of styles, designs and materials is unlimited. 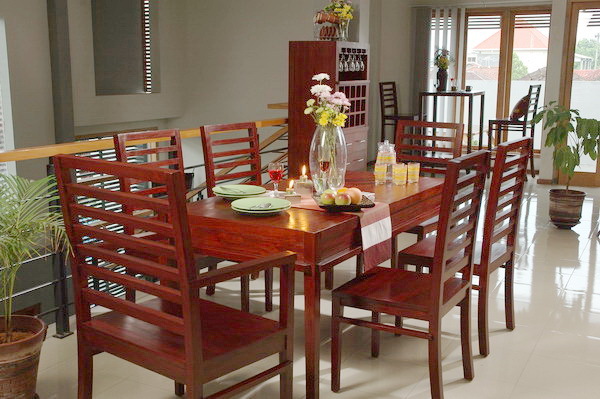 There are many of dining room furniture or dining sets in modern style. Modern tables and chairs with a variety of styles, colors, and additional furniture pieces to complete our dining room and to make our dining room look great, stylish and comfortable. We can choose the dining sets or dining room furniture like the table and chairs that perfectly match the style of our home. There are many options to choose from, so whether you have a large family or just like to entertain large groups. We provide you some interesting furniture style for the dining room design from the high quality,top manufacturer. Merbabu dining room, Muria dining room, Bromo dining room, Merapi dining room, Raung dining room, Rinjani dining room and Krakatau dining room . Dining room furniture modern Style has designed to give your dining room space an innovative look. Dining sets such as table and chair in the modern design can be customized by adding or removing items that you need especially if your home interior as modern design. Mostly this design choose by the people who want to put their dining situation near or direct to the living room area.